When asked what foods San Francisco is most known for, oysters always come to mind. While you can get great ones in the city (Hog Island Oysters at the Ferry Building, Swan Oyster Depot on Polk Street), they’re even better at the source in Tomales Bay -- part of the Point Reyes National Seashore. The road up to Point Reyes also happens to be an excellent 40-50 mile bike ride through redwood groves and along craggy coastlines. Depending on which route you take, you might even end up on the scenic Highway 1 for most of your trip. While Jon and I often bike up there when we want a difficult, 100-mile day (don’t judge, oysters make GREAT mid-bike ride snacks. GREAT snacks. ), it’s always a treat to make a weekend out of it. In the summertime, we’ll camp. But last winter, we decided to cozy up in a bed and breakfast instead. Want to make your own weekend adventure out of biking to Point Reyes? Use this guide for routes, food and hotel recommendations, and tips to plan your own overnight bike trip to Point Reyes. Quick Stats: What's it Like to Bike to Point Reyes? The route: Ride along coastal Highway 1 through Stinson Beach and Olema, or take an easier route inland through Fairfax and Samuel P Taylor State Park. Where is Point Reyes? roughly 30-40 miles north of San Francisco, on the coast. Why go: Beautiful views of Tomales Bay and the Pacific Coast, oysters, fresh cheese, great hiking and cycling, elk, and a historic lighthouse. View the full route on Strava. Early one Friday afternoon, Jon and I set out for Inverness, a cluster of homes and shops too small to be called a town, next to the Point Reyes National Seashore. Our destination: Ten Inverness Way, a small, rustic bed and breakfast just yards away from Tomales Bay. In the spirit of our laid-back getaway, we opted against the coastal route up Highway 1, which would involve a lot of climbing. Instead, we chose the easier route inland through Fairfax and Samuel P Taylor State Park. The first dozen or so miles took us through well-beaten paths: over the Golden Gate Bridge, through Sausalito, up Corte Madera, and into a splay of cute, small towns and character-filled neighborhoods. By the time we reached Fairfax, my favorite little hippie outpost in California, I was starving. We stopped at Good Earth Natural Foods so I could scarf down a slice of pizza before moving on. Leaving Fairfax means entering the countryside. After 20 or so miles of ogling picturesque houses, it always feels abrupt to climb the hill out of Fairfax and descend into an open sea of green trees and golden grassland. It’s also really fun: after building momentum on the descent, the stretch between Fairfax and Samuel P Taylor is flat and long — perfect for picking up speed. Eventually, the road curved into the shady, redwood forest in Samuel P Taylor State Park. The new(ish), smoothly paved roads in the park make it one of the smoother stretches on our route. Emerging from the forest, we faced one last climb: a couple miles of exposed road, inching up and up until finally the world seemed to open. We could finally see what we had been biking for: the seashore. Done with the climb, we cruised down towards the water and north along the coast, veering left at the start of Tomales Bay, and finally arriving in the small “town” of Inverness. After a warm, cozy night at Ten Inverness Way and a breakfast of buckwheat waffles, we set out again to explore the area. Even though Point Reyes National Seashore is a mere 40 miles north of San Francisco, it’s surprisingly rugged. Most of the “development” in this area has come in the form of farms, creameries, and fisheries. Built in 1870 and retired in 1975, the Point Reyes Lighthouse is an important historical landmark. During its use, it saved thousands of ships from wreckage in the windy, foggy waters off the coast of Point Reyes. If you bike there, you’ll have to leave your bike at the top of the long flight of stairs that lead down to the lighthouse to explore inside. When Jon and I got bike bells, we decided one ding means “move it!”, two means “I’m here!”, and five means “elk!”. We never used it seriously until we biked to Tule Elk Preserve at Tomales Point. Our route was literally blocked by dozens of elk running across the road and into the field beside us. Perk of being on bike: we didn’t scare them away like the cars who followed behind us. Just behind the convenience store in Inverness sits the Point Reyes Shipwreck. It’s a fun stop for Instagram photos and picnics as you head up to Tomales Point. And (don’t tell too many people) a lot of sea beans grow there. Although, sadly, a fire in 2016 destroyed the stern of the decaying boat, it’s still there (and still being Instagramed). The trail to Alamere Falls is undoubtedly the most iconic hike in this region, taking trailblazers past a rare waterfall (tidefall) cascading down 30 feet of cliff into the ocean. While you can’t ride your bike there, any list of things to do in Point Reyes would be amiss without this. The most famous spot, Cowgirl Creamery, sits in downtown Point Reyes Station (try the Mt. Tam cheese!) but Nicasio Valley Cheese is also good. While Hog Island Oysters gets most of the attention, I prefer to head to the more humble Marshall Store in Marshall. Get the half crab / oyster combo and smoked fish to get a sampling of their best. Tomales Bay Oysters is also a great, no-frills, nothing-but-oysters pitstop. Just bring your shucker, because you’ll have to open your own. All of these places are great for lunch. If you’re sticking around for dinner, try rustic Saltwater Oyster Depot in Inverness, about a block away from Ten Inverness Way. Sidle up to the bar, order a bottle of wine, and warm up with dishes like rabbit cassoulet, seafood chowder, or a full grilled fish. They also serve breakfast and lunch. 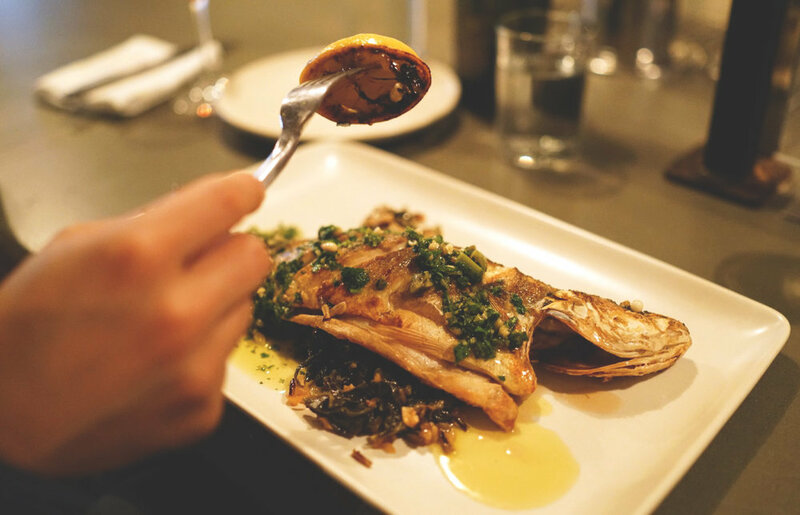 For fancier but equally delightful fare, head a little further south to Olema for a 5-course dinner of local, seasonal fare at Sir and Star at the Olema. It's a splurge, but splurge-worthy. Whether you’re on a budget or ready to splurge, there’s quite a few options of places to stay in Point Reyes. There are also a number of Airbnb and Hipcamp options worth considering. Staying at the mom-and-pop-run, tastefully-designed bed and breakfast, Ten Inverness Way, was a treat. It’s a two night minimum on the weekends, though, so we ended up leaving work early on Friday to spend the weekend here. Samuel P is one of the most popular campsites outside of San Francisco, nestled in a cool redwood grove alongside a creek. While car camping sites book up far in advance, the hiker/biker campsites are first come first serve. No need to reserve. Hosteling International USA has a hostel in the Point Reyes National Seashore. It’s homey, full of books, and totally off the grid (re: no cell phone service). They also give a small discount to cyclists (yay!). Just make sure you have food for the night before arriving -- it’s a steep climb out of the hostel and you won’t want to do that more times than you have to. For bike camping, a warm sleeping bag is a must even in the summer.